Anyone with an ounce of intelligence would know that heading to Notting Hill in search of a bookshop during carnival weekend is not the most sensible of ideas. Apparently I'm not one of those people, because as I made my way out of the tube station at Notting Hill Gate, surrounded by colourfully dressed revellers, it didn't occur to me that perhaps I'd not chosen the best of days to visit the rather classy sounding Lutyens & Rubinstein. In fact, it wasn't until I'd crossed the path of a couple of floats, walked almost the length of Kensington Park Road, navigated my way around the odd bit of spontaneous dancing and resisted the temptations of numerous street food vendors to finally stand outside the temporarily boarded up shop that I realised I'd made a mistake. Sometimes it really does take a while for the penny to drop. Fortunately, my naivety means I'm also yet to overcome the touristy habit of looking up at my surroundings, so earlier in my visit - before I'd crossed the path of the parade - the crowds had parted to reveal Book & Comic Exchange. And what a welcome discovery it was. I may have only been at the carnival for five or ten minutes, but I was already feeling a tiny bit isolated and lost as a lone girl among so many revellers - the sight of a bookshop was like a beacon of light, guiding me from danger. As soon as I stepped through the door I knew I'd found my safe harbour with the wall of secondhand books that greeted me. I was so caught up in this view that I barely noticed the comics in the centre of the room, and was unable to tear myself away to explore the rest of the shop. Instead I happily browsed my way along the wall, eventually picking up a themed Penguin, First Love by Ivan Turgenev. What can I say, I've a soft spot for Russian writers. Having selected my purchase, it was at the till that I finally paused to realise what a quirky shop I was in. 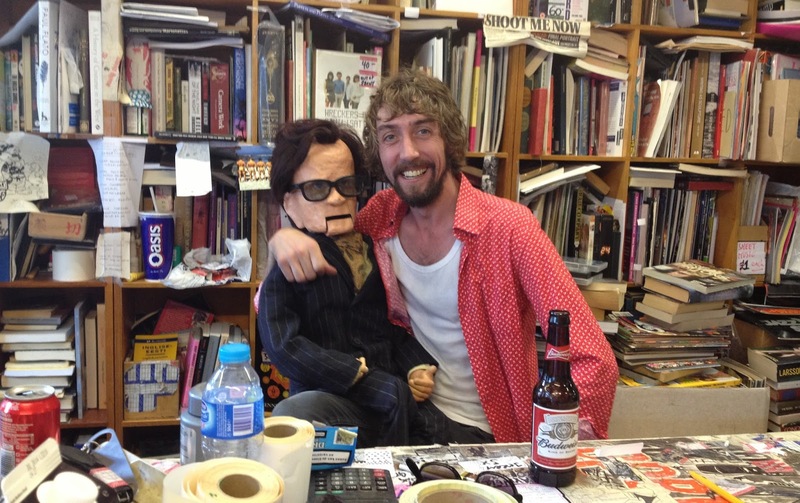 Sure in some ways it was a fairly typical secondhand bookshop, with goods crammed into every space, but it's not often you discover puppet psychogeographer Kenneth Desmond behind the counter you're queuing at. 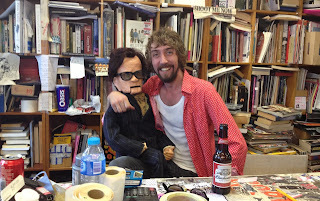 As I handed over my cash his human, Matt, introduced the two of us and told me a little about the puppet's creation (by the human) and journey as a film star. I'd've loved to have found out more, but the bookshop was filling up and I had a bookshop to get to, so I thanked them for their time and went on my way. If only I'd known what lay ahead I'm not sure I'd have left my sanctuary.